Cut each sausage into 4 equal lengths, then cut each section lengthwise, but not all the way through, so sausage lies flat. Heat oil in a large non-stick skillet over medium heat until hot. 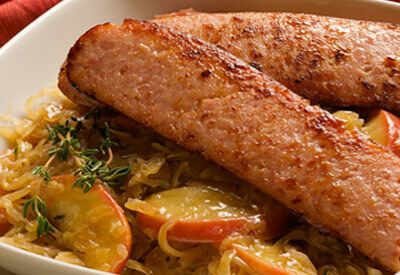 Cook sausages 4 minutes per side or until lightly browned. Remove from skillet and keep warm. Lightly toss sauerkraut, brown sugar, Dijon mustard and thyme (if desired) to combine. Fold in apple slices; pour into same skillet and top with sausage. Cover and cook 5 minutes over medium heat or until apples are tender. Add salt and pepper to taste.